Twice a week - rain, hail or shine - volunteers from Street Outreach assemble to distribute food and clothing to Dublin's homeless community. Living on the streets is extremely difficult, especially in winter, so we're always looking for volunteers. Just having a quick chat or even proffering a friendly smile can make a big difference to a person experiencing homelessness. For those of you with a busy schedule, there's no need for a weekly commitment to this activity - just sign up whenever you're available! Whether you do it once a week or once a year, you will definitely find it worthwhile! Georgina, Roisin, Lisa and Aisling organise Street Outreach, and if you want to come then send them an email at streetoutreach@trinityvdp.com. 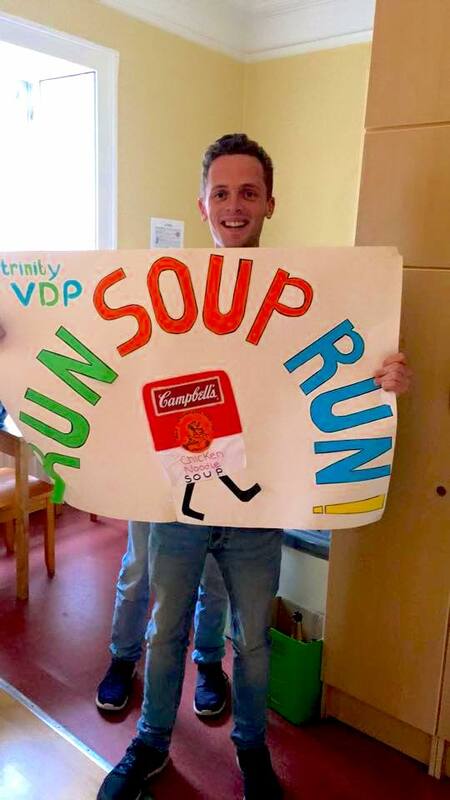 The Social Justice Committee is Trinity VDP's newest activity and unique from the rest. The group meet once week to discuss the rewarding opportunities that the society offers and to educate others about the nature of voluntary work. This activity is all about both becoming more aware of the social issues that the people we work with are facing every day, and trying to seek practical ways to help those in need. Social Justice hold events on campus and invite guest speakers to raise awareness and highlight social problems. If you're interested in getting involved with Social Justice, send Roisìn, Mìde and Lillie an email at socialjustice@trinityvdp.com! Each night of the week, a group of volunteers will go to DePaul’s Brú Aimsir facility on Thomas Street and provide assistance to the service users and permanent staff there. Brú Aimsir is an emergency homeless hostel facility set up in 2015. Last year, we were in charge of assigning and managing lockers and laundry lists, but this year we want to do more. With more volunteers and experience under our belts, we hope to additionally provide evening entertainment to the service users in the form of art or drama clubs. Email Peter and Hannah at depaul@trinityvdp.com to get involved with this wonderful activity.